Inshore, pompano and bluefish have arrived in our area, both in the surf and in the lagoon. The pompano can be caught on sand fleas and clam strips in the surf and caught in the lagoon on Buccaneer Wigglers, blanched sand fleas and pompano jigs. Small jack crevalle have been hanging around the turning basin and just below the south bridge around the sanitation treatment plant. We have a gorgeous morning at the inlet. Winds are blowing out of the Northwest at 8 mph and the water is calm. We have a great weekend forecasted as well, mid 70's, light breezes and good water conditions. Boaters should always check the coastal forecast prior to going offshore as conditions can change very quickly. Go to the inlet and take advantage of the beautiful weather this weekend! Yesterday morning the Black Drum bite was fair off the north jetty. The bite slowed from the day before but things are constantly changing. Several Pompano came over the rails of the north jetty. There were boats lined up outside of the channel fishing for Flounder but we don't know if they had any success. The shore anglers weren't having much luck. A couple of guys were slaying the Sheepshead off the south catwalk, we will have some photos up next week. Our above photo today features Pearce with a nice Sheepshead landed off the north jetty. It's another cool but beautiful morning at the inlet. The fish seem to have been invigorated; they've been biting well. This morning winds are blowing out of the Northwest at 4 mph and the water has finally calmed down. Yesterday was a real good day for Black Drum according to Mike . Mike showed up at the inlet just after sunrise and landed his limit of five in about an hour while fishing the end of the outgoing and the beginning of the incoming tides using dead shrimp. Mike reported about a dozen Drum landed in the two hours he was there along with a Pompano, Sheepshead and Whiting. Mike is featured in our photo today with his Black Drum. Walton at the Inlet Bait and Tackle Shop reported the rest of the day the Black Drum hit like crazy, along with some Pompano, Sheepshead and a few Flounder. Reds, big Snook and Tarpon are hitting in the evening hours. Send in your photos and your fishing updates!!!!!!!! Inshore, spanish mackerel and bluefish have moved into the inlet and the turning basin. Anglers are finding success with spoons, gotcha's and cut bait. This morning reports that the inlet last night was full with tarpon busting up the mullet schools. Redfish are still north in the lagoon on the west side and snook fishing along the south side of the inlet has been good for some catch & release action. Temperatures took a dip last night and we have a chilly morning at the Sebastian Inlet. Winds are blowing out of the North-Northwest at 12 mph and the water is choppy. Anglers are bundled up this morning, it's cold but beautiful. We have blue skies and very little chance of rain today. These cold snaps have a tendency to get the fish biting! There is a small craft advisory in effect, always check the coastal forecast prior to going offshore. Walton at the Sebastian Inlet Bait and Tackle Shop said the Black Drum bite was good all day yesterday, along with Flounder and some really big C/R Snook. Sheepshead have been active around structures, rocks, pilings, docks, etc. Father and son Anthony and Pearce of Ocala are featured in aboves photo. The family was fishing the north jetty on and limited out on Black Drum. What a beautiful morning at the inlet. Winds are blowing out of the Southwest at 10 mph and there is a moderate chop on the water. We may see some more rain this evening, bringing a little cooler weather our way. Hopefully the cool snap will invigorate the fish! There is a small craft advisory in effect from 7:00 p.m. this evening through Wednesday morning; boaters should exercise caution. The Black Drum bite picked up over the long weekend, Ponce and Trina went to the inlet on Christmas Day with a pack of friends in tow and they limited out. Trina reported a wonderful day of fishing off the north jetty and sent in lots of photos that we will be posting this week. SISP Ranger Ed fished over the long weekend and after work and reported a few Flounder (Gulf and Southern), and a few nice Blues. Along with the Black Drum, Sheepshead can be found around the rocks and pilings, Pompano have started to show up, a few Blues and we are still seeing a few Flounder. A lot of jellyfish have blown our way, use caution if swimming or surf fishing. The right photo is of Ed who was fortunate to get out and do some fishing Friday evening and landed a Southern Flounder that was 5.5 lbs and a Gulf Flounder that was 3 lbs, which is a good size for a Gulf Flounder. The left photo is of Trina with a one of the Black Drum he landed on Christmas Day. Reports of anglers catching mangrove snapper, trout and cobia in 35' off the north beach on Sunday night using live shrimp. A few flounder have been reported from the south jetty. Anglers there have been using live shrimp and small jigs tipped with a piece of fresh shrimp. One angler reported a catch of redfish about midway between the north bridge and Harbor Branch on the west side of the lagoon. The past several years, January has been a cold month around the Treasure Coast. Hopefully this will be a mild winter and you won’t have to worry about the water temperatures as much this year. Fishing in deeper water will provide you with better results on most days. 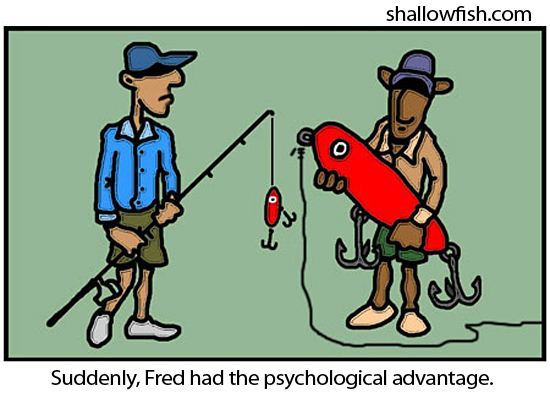 Working your lures and baits much slower will also give you more success. Fish tend to become lethargic in cold water and are slow in moving to strike at a bait. Finding water that is a couple degrees warmer than the surrounding area can also give you an edge on finding fish. We had great results last year on fishing deep sand holes on the flats that were being warmed by the sun. We will certainly be doing that again this year. January is typically a windy month. You might enjoy one or two days a week that is calmer, but expect it to be windy. The river can be rough some days, but you can still fish most days if you plan your trips carefully. It is a great month to fish in spite of weather conditions that might not be to your liking. Bridges will continue to produce sheephead, black drum, croakers, sand perch and bluefish. Most of the anglers on the catwalks prefer live or frozen shrimp for these fish. The inlet and turning basin will be full of bluefish, jacks and mackerel this month. Live or dead bait on a jig head will give you plenty of action along with silver spoons or shiny lures. Around seawalls, channel edges or deeper structure you can find grouper for catch and release action in January. Snook action around the jetties and bridges will be active mostly at night for anglers using feather jigs, TerrorEyz and live bait. Snook closed on December 15th, so it will catch and release on them. Redfish can be found around docks and sitting on the flats on warm, sunny days. DOA shrimp, Terror Eyz or CAL jerk baits work great for wintertime fishing. Docks will be loaded with sheephead in January with nice sized fish. Pompano fishing will depend on water temperatures for their location, but they will be in the area throughout the winter. Surf anglers will be targeting these fish on days when the beach is fishable. Flounder should be found around the jetties on the beach side and on sand flats around the inlet. If you can find warmer water on the flats, you will most likely find trout feeding in those areas. Last year, we were rewarded many days as the sun would warm up a patch of water and get the fish actively feeding. CAL jerk baits were very successful on the trout. Ladyfish will be all over the river for fun action for the little ones. January Tips: Dress for the weather. We might get one or two days each week that might be warmer, but most days will be on the cooler side. There can be a 30 degree swing in temperature on some days. Dressing in layers can keep you comfortable throughout the day in January. Once you become cold, it's hard to warm back up again. Keep yourself comfortable and enjoy some good fishing in January. Stay warm and safe and enjoy the winter! Yes , There are some really Nice Pompano Around ..Try either Docs "Goofy Jigs" or Shrimp tipped jigs .I would also try Clams in the surf. I also hear that some anglers are floating shrimp back along the Stuart and Jensen Causeway. Little Bill" Billy Gentry " brought in a 19 incher this morning. There has still been a good Trout Bite and some Red Fish mixed in up north of Bear Point. Try Doa Cal Shad tails in darker colors and also Doa Clear n Gold Shrimp 1/4 oz and also Bassassians in the Darker colors too .. Try a Shrimp on a Popping Cork too it has been very effective . Lots of Snapper throughout the river and near all bridges Jensen, Stuart, Roosevelt n 10 cent.. Also the Spanish Macks are all over the river. Inshore, reports of good flounder fishing have surfaced over the last couple of days. Calmer winds today will allow the surf fisherman back to the beach. They will be looking for whiting, pompano and bluefish using sand fleas,clam strips and spoons. One customer told me his son has been doing well on tarpon and snook using 2 ounce jigs fishing in the inlet. We have a mix of sun and clouds this morning. The wind has calmed down significantly; it's blowing out of the South-Southeast at 3 mph and the water is calm. There is a small swell at first peak this morning and a few surfers are in the water taking advantage of the conditions. Please use caution when casting into the surfing area. We received an update from inlet regular Mike who was out on the north jetty yesterday. Mike reported two keeper Black Drum; he was lucky to land one at 25" the other one 19", the others were undersized and there were quite a few. A lot of small Jacks, one Whiting, several Sheepshead and one oversized Red. There were also several large fish that were hooked up but broke off or simply spit the hook. Dead shrimp and clams were the most popular baits. Trevor fishing from shore landed six undersized Flounder, all around 11" and a fat 24" Sea Trout by the Tide Pool. Trevor reported that a lot of Sheepshead were landed by the rocks. SISP Ranger Ed sent in our next photo of a C/R Fat Snook. Ed took the opportunity to photograph it well, as it is so different from the common Snook. The Fat Snook has a deeper body than other Snook, their color is yellow-brown to green-brown and silvery on the sides, black lateral line extends onto the tail, the mouth reaches to or beyond the center of the eye, it usually has no dusky outer edge on the pelvic fin and it has the smallest scales of all the Snook. It's a beautiful day at the inlet. We have a mix of sun and clouds forecasted for today with very little chance of rain. Winds are blowing out of the Southwest at 8 mph and the water has a moderate chop. An advisory for small craft remains in effect. Evenings have still been producing big Tarpon and oversized Reds. Daytime fishing remains slow, but even if the fish aren't biting well, there's always something interesting going on at the inlet. Migrating birds have found their way to the inlet for the winter nd they are always fun to observe. Sebastian Inlet is one of the prettiest spots in Florida; go take a walk or ride around different areas of the Park! Inshore, fishing for redfish and trout has been good in areas out of the wind. Snook fishing has been good for some catch and release action in deeper water, like the turning basin or the inlet using red tail hawk type jigs. The easterly high winds have kept the surf fishermen off the beach the last few days. Look for bluefish, pompano, whiting and mackerel to return as soon as it settles down some. This morning winds are blowing out of the South-Southeast at 16 mph and there is a moderate chop on the water. A small craft advisory remains for offshore. Always check the coastal forecast before going offshore, conditions can change very quickly. Fishing remains hit or miss, mostly miss! A variety of small fish are being landed during the daylight hours but nothing in big numbers or with much size. Nights are still bringing us some oversized Reds and big Tarpon are giving inlet anglers a good workout. Please remember that Snook season closed last week and will not reopen until February 1st. Snook are strictly catch and release at this time. Our photo today features Alec and his buddy Jared, both juniors at Harmony High School, were wading the mangroves just north of the inlet around 9:00 a.m. when Alec hooked up with this real nice 26" slot Red. This was his first catch on a new St. Croix Avid with a Shimano Stradic 4000 and GULP shrimp. Alec released the Red unharmed. The below photo features Ben who landed his 28" Black Drum off the north jetty last Thursday using dead shrimp. Fishing the north side of the north jetty on an outgoing tide, Ben landed his largest Black Drum to date. Sunday I went up to Juno Pier checking the water conditions ----alittle ruff but not too bad. Some of The COBIA Guys where out and reports of some spotted doing last week and afew caught one just before I got to the Pier on Sunday. Most of the action was close to shore, the CROAKER and WHITING where the catch of the day. The anglers where using shrimp as bait, some nice fish came over the rails. Wind and more wind, like three weeks of it, now I am not sure if we have learned to work with it or just ignore it. Surf has been off and on because of conditions, some days the surf has just been to ruff to fish and others fine. Blues and Jacks make up the bulk of the catch and not from every beach, if it is not happening at you site, change location because these fish are there. Spoons have been the bait, but a piece of mullet will get their attention, from sun up to mid morning has been the bite time. A few Pompano and I do believe it is conditions for the angler not that the fish are not here, wind and more wind. Did hear about a few Whiting and Croakers this week, first in a while, Fish Bites has been the preferred bait, it stays on the hook. Bridge anglers it has been big Mac’s, real nice mackerel. Jigging for Pompano and catching Mac’s and yes a few Pompano, the bridges at the east ends of the causeways has been their location. Yes, the Pompano are here it is about conditions, one spot that has more favored is the cuts at the south end of Sail Fish flats, fish the incoming. Lots of Trout, they know the season is closed, Snook again the season is over, so guess who is chewing and the pesky Reds have not slowed. River fans this is your weather because the rest of the area is blown away with anticipation. As we near closing out 2011, I would like to wish everyone a Happy New Year and hope that 2012 is prosperous for you all. We have had a lot of fun this year out on the water. Made a lot of new friends and saw many of our old friends again. I look forward to lots more fun and action again in 2012! We had a very nice week without as much wind and lots of sunshine to warm up the river. Water temps are in the mid to high 60's and the fish have been feeding. 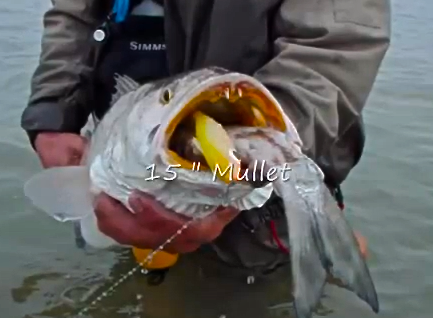 A variety of different species have been on the flats and shallow water fishing has been very productive for us. It's been fun! Trout season will open up on January 1st and the bite has been good. DOA shrimp, Terror Eyz and live bait have worked very good on the flats. Most of our fish have been in three to five feet of water. The redfish have been in shallow water. Fishing mangroves or pot holes on the flats can find a good redfish bite lately. The population continues to improve each year and you can find many more anglers seeking a battle with a redfish. The inlet has held Spanish mackerel, bluefish and jacks that will hit shiny lures on the incoming tides. Bridges, docks and structure will be holding sheephead and black drum that can be caught on live or dead shrimp. I've heard of some flounder and pompano, but the bite should continue to improve as the water temps continue to fall. It's been an exciting week so plan on getting out soon! We have windy conditions at the inlet this morning. Winds are blowing out of the Southeast at 16 mph and the water is choppy. Small craft should exercise caution. The bite has slowed at the inlet. Friday was absolutely abysmal, three keeper Black Drum were landed off the north jetty along with small Jacks and small Black Drum in the 12" - 13" range and that was it for the north jetty in the morning hours. The south side was a little better with several Flounder in the 3 - 5 lb range and one keeper Red landed by SISP Ranger Ed . Inlet regular Roger reported that the night bite for Reds and Tarpon has been very good. Thursday evening approximately 15 Reds over 25 lbs were landed from the north jetty, mostly on jigs and pinfish. Roger estimated there to be hundreds of Tarpon in the water that evening. 8 year old Josh who was fishing with his grandfather from the south jetty when he landed this dinner sized Flounder using live finger mullet. Josh also has a 20" and a 22" Flounder under his belt, a budding young angler if we've ever seen one! Photo on top is the one of the luckier anglers on Friday, Jerry. He landed two of the three keeper sized Black Drum Friday morning off the north jetty using dead shrimp. Sorry for the late report, guys. The trout fishing has been amazing all week. There's been a few reds as well, but the trout and ladyfish have been so fierce it's hard not to hook into them. I've been out on the water the past 5 out of 6 days, and I'll tell you this we've pulled up more trout and ladyfish than empty hooks. I even brought out my fly rod out today and landed fish on probably 75% of my casts. I even caught a ladyfish on a back cast! The key has been small baits. There's glass minnows galore out right now and the trout are tearing them up. The smaller jig or popper you can get ahold of the better. Small jigs doesn't mean small fish though. There's alot of gator trout out right now! Wow, looks like the winds will finally let down a bit. We were out a bit today there are Spanish Macks just inside the inlet and some Pompano are moving threw the Hole in the Wall and the Cross Roads areas located just inside the inlet. Please ask us when you stop in for bait ect we will be glad to direct to the spots we mention all the guys are helpful. I had a request for land fishing areas ,ok, here we go as far as Wade Fishing at Hermans Bay and Walton road have been hot for Trout and Redfish some catchs of 50 Trout between 2-3 Anglers and that is not uncommon. Try DOA Cal Jerk Baits and Cal Tails and also Bassaians swim baits for the best results . Snook Season is now closed. Inshore, lots of Mangrove Snapper are in the river and the bait is LIVE SHRIMP . Try the bridges and the docks threw out in the river you should do well . Redfish and Trout have been biting at the Club Med area and the east side of the Indian River north of Jensen Causeway. Well I hope everyone has a great week and be safe around the Holiday. SNOOK SEASON IS CLOSED UNTIL FEBRUARY 1st, CATCH AND RELEASE ONLY!! We have overcast skies at the inlet this morning and we may see some rain late this afternoon and this evening. We have partly cloudy skies forecasted for the weekend as well. Winds are blowing out of the South-Southeast at 13 mph this morning and there is a light chop on the water. A small craft advisory remains for offshore. Boaters: Always check the coastal forecast before going offshore. A lot of Sheepshead have been finding their way onto inlet angler's hooks. There have been some real nice ones landed in good numbers, according to Tommy of the Sebastian Inlet Bait and Tackle Shop. Black Drum continue to hit but not in huge numbers. Flounder are still in the inlet as well. Rob pictured with three of seven real nice Flounder he landed Wednesday afternoon on the south side of the inlet. Rob said the largest one was eight lbs, but all the fish were nice! Beautiful! Sebastian Inlet State Park Ranger Ed sent in our next photos, Photo two is of brothers C.J. and Mike who landed 11 nice Flounder in two days. The largest fish is in the 9 - 10 lb range another was 8 lbs and all were real nice fish. Photo of those Flounder on the cleaning table. From this angle, you can see the thickness of the fish. Very nice! Inshore, the south jetty at Ft. Pierce has been producing some snapper, flounder and good sized sand perch. Now that the season for snook fishing is closed, the south side of the inlet has heated up a little over the last few days. Bluefish and spanish mackerel haved moved into local waters and can be caught on spoons and got-chas. Winds are blowing out of the East-Southeast at 11 mph this morning. There is a mix of sun and clouds but we are not expecting rain today. A small craft advisory for hazardous seas is in effect until this afternoon. Boaters should always check the coastal forecast prior to venturing offshore. The big attraction at the inlet has been Flounder. There has been a smattering of Black Drum, Sheepshead, big Snook, Reds and big Tarpon in the evening hours. Rob Moore of Orlando is one of the anglers who did well yesterday with Flounder. Rob landed a heap of good sized ones yesterday afternoon. Hopefully we will have that photo up for you tomorrow. Todays photo is of anglers on the north side fishing for Flounder near the Tide Pool. 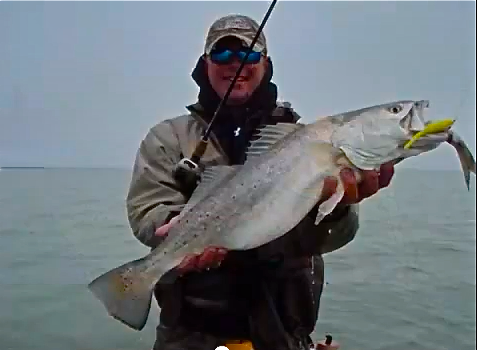 Now despite the wind and rain, river fishing has continued to stay consistent. Trout season is closed through Jan. 1st, so of course you can’t keep them off the hook, and yes the redfish are everywhere. Had a few kayak anglers in this week, and little mud creek was the place to get out of the wind. 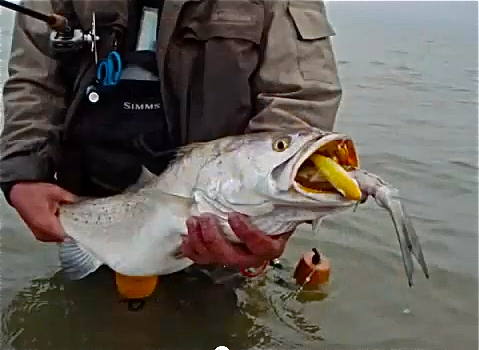 They reported trout in great numbers on soft rubber baits and top water plugs, and slammed the redfish. Avocado red glitter was the color of choice, with an 1/8 oz jig head. Working the docks on the west side of the river has produced redfish and trout as well, when the wind allows. Plenty of jacks, blues and ladyfish to bend the rods as well. And Go Catch A Fish! If you haven't, make sure you check out Dec. 10th and 12th. post on the site... Some good stuff. We have windy conditions at the inlet this morning. Winds are blowing out of the North-Northeast at 16 mph and the water is choppy. Waves are coming over the railings of the jetties; go prepared if you head to the inlet today. There is a small craft advisory in effect through Thursday morning. Walton at the Sebastian Inlet Bait and Tackle Shop reported the Flounder bite was still on this morning. We've also seen Black Drum, Sheepshead, Snook, Reds and big Tarpon in the evening hours. Our photo is of Luis who was using dead shrimp and clam combos to land his fish. Another report of seven Snook landed on bucktails and a few Sheepshead coming over the rails. The holidays are already upon us. Where has this year went? Time passes by way to fast anymore!While it ended up being a wet and windy weekend, the fishing continues to be good around the Treasure Coast this week. The rains have left for now, but expect continued windy days throughout the rest of the month. The redfish bite has been good around the river recently. Fishing docks and flats have both been productive from Round Island to Bear Point along the river. Live bait, Terror Eyz and DOA shrimp have all worked for us. I had Savannah and DeLora on board for the Treasure Coast Casters first tournament. We caught trout and snook on live bait and Terror Eyz along with lots of ladyfish to keep us busy on a wet day. Bridges have held sand perch, sheephead and black drum. Bluefish, mackerel and jacks have been hanging around the turning basin to the jetties. Pompano have been out in the river and along the beach if you could find nice weather to get out and fish for them. Snook fishing at night has remained good for those anglers using live bait, Terror Eyz and jigs. The fishing has been good, just challenging this time of year. Have fun and dress appropriately for the conditions and you will enjoy fishing this time of year. It's a soggy morning at the inlet. We had lots of rain off and on over the weekend and it will continue today and tomorrow. Those waterproof anglers who got out and fished over the weekend did quite well, particularly with the Flounder. Along with Flounder, anglers landed Black Drum, Sheepshead, Reds and Snook but the big attraction was Flounder. We received an update from Sebastian Inlet State Park Ranger Ed who is spending his vacation fishing the inlet. Ed reported Friday the south side was packed with anglers fishing for Flounder and 40 - 50 large fish were landed between sunrise and 11:00 a.m. Ed landed six that averaged five lbs and sent in our first two photos today. The first photo is of Dave who landed several seven pounders and an eight pounder. Photo two is of the eight pounder on the cleaning table which shows the thickness of the Flounder, very nice Dave! Thanks for the photos and update Ed! The evening Bite landed a couple of nice keeper Reds, 22" to 24", some slot Snook and some big Tarpon that absolutely wore anglers out! Was on ---- Texastacklefactory.com ---- site again, ( I'ts becoming one of my favorites, other than my own site) and found these photos along with a lot of other infomation I'll be posting. I plan to be using some of there fishing soft plastics, plugs and other products over the next few weeks and will give a full report. I think what they are doing and using in Texas will work GREAT here in Florida. Always looking to get as much info. I can out, I do a lot of web surfing looking for what I think are great Ideas, Products and Techniques, to help MYSELF and YOU my readers catch more fish. 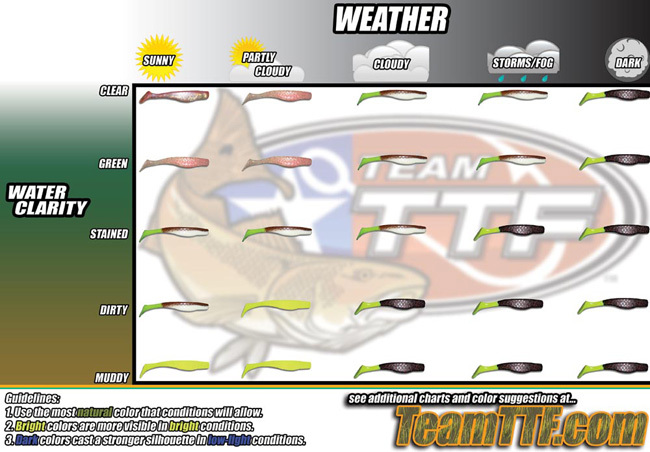 This is very helpful from Texastacklefactory.com................( Note they are using there brands of soft plastics "Which I Like Alot"
Anglers are reporting good snook fishing around the bridges for snook using jigs, live bait and deep running lures. Flounder catches have ticked up a bit, around the lagoon and in the inlet. 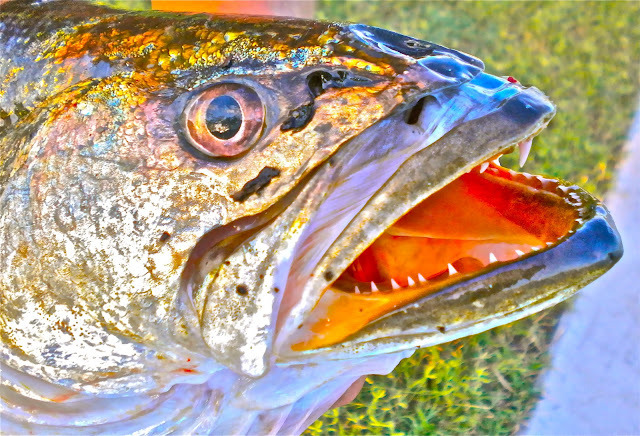 Reports from the north end of the county have been good for trout and redfish. The new and hot selling Yo-Zuri Crystal 3-D Shrimp has been working well for trout and redfish. The Pompano bite has improved and the as cold front pushed threw the bite was pretty good yesterday try the Sailfish Flats or hole in the wall area...Also the cross roads and the Area at Hells Gate . Doc's Goofy Jigs are the ticket . Jayson ,reported today yes today how about over the last 3 days over 100 trout and today a mere 50 caught .. The Trout season opens on January 1st .The baits of Choice is DOA Cals ,Shrimp on the Deadly Combo , Bassassins in darker colors with the clean water. Snook season closes on 12/15 so get out there now and catch some they are biting well still at the Bridges . This morning winds are blowing out of the East-Southeast at 10 mph and the water is choppy. There is cloud cover and potential rain later today and over the weekend but at least it warmed up! Yesterday was pretty cold out on the jetties. Fishing was slow overall yesterday but a few nice Black Drum were landed off the north jetty and one particularly nice Snook in the morning hours. A couple of Sheepshead were landed off the north catwalk. A few anglers had good luck with Flounder but many were undersized and returned. Our Photo today is Steve Bass of Sanford with two of the four good sized Flounder he landed yesterday on the south side of the inlet. Steve was using finger mullet to land his Flounder and estimated the larger one to be in the 7 lb range. Let's face it, the water is starting to get cold. You want to be able to wade comfortably all day, but wet wading has you getting out of the water every 30 mins. What you need is a pair of waders. You can spend between $40-$700 on a pair of waders. What are the differences between waders? Neoprene waders are fairly inexpensive and will definitely keep you warm, sometimes too warm. Neoprene is a relatively strong, stretchy material that sticks pretty close to your body. Neoprene comes in a different thicknessess, usually between 3mm-7mm. The thicker you go the warmer you are. Thicker waders are also harder to puncture. I would never go with 7mm in florida, unless you like being really toasty. A disadvantage of neoprene waders is that they dont "breathe" and your sweat stays has no where to escape. Overall they are a good all around choice for most anglers and range from $50-100 in most cases. Breathable waders are fairly new technology (1990s) compared to neoprene and rubber waders. They allow your body and sweat to breathe when in the water. You can comfortably wear breathable waders in 70 degrees or 10 degrees as long as you layer, accordingly. When breathable waders first came out, they werent very durable. That has all changed in the last 10 years are so, and they are models built for hiking and brush busting. Most breathable consist of either toray fabric (every company has a different name for toray) or Gore-tex. Gore-tex is the more durable and breathable material of the two, but costs quite a bit more. Toray has made many advances and is not too far behind, but it is a little bit heavier. Toray waders run between $80-500 while Gore-tex waders run between $300-700.